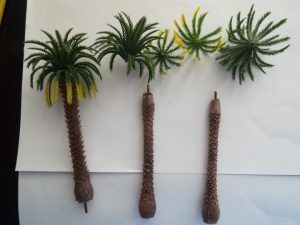 Recently bought some palms from one of the Chinese Suppliers via ebay. I was fairly happy with them, and the price is very good, but wanted to give them a bit extra and make them a little bit more realistic. At the same time, found some bunches of bananas that I had made a while back and decided to give them a paint job, and add them to some banana trees I constructed years ago – suspect the instructions for the trees are on the old warfactory pages. 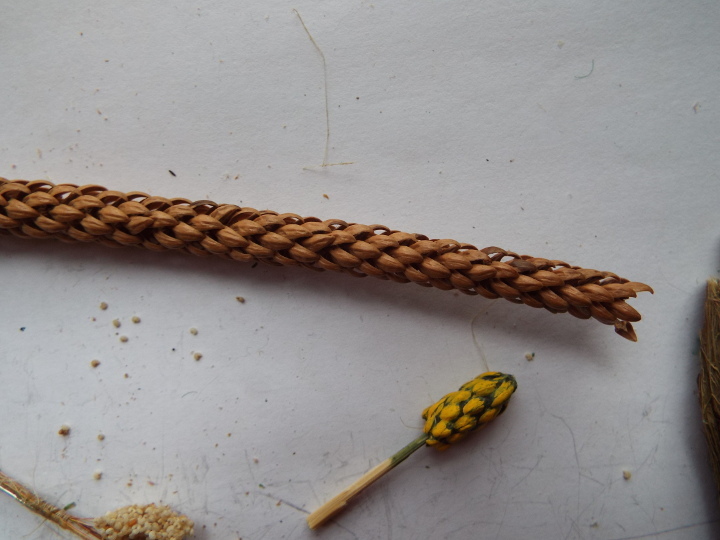 Starting with the bananas, I came across some twigs when on holiday in Cyprus where the dried leaves on the stem have something of the shape of bananas. I also used a section of them, added to a dowel, to give the impression of carved stone leaves at the top of a 15mm column used in my biblical temple. As a brief aside, I think that a more accurate impression of bananas would be got by using Caraway seeds available in food stores. 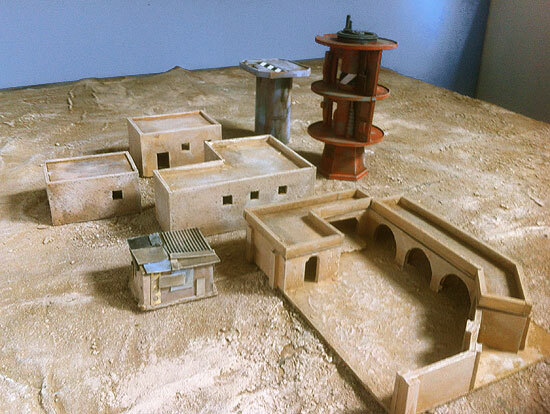 They make great 28mm scale bananas, but building a bunch of them would be fiddly. My method is quicker if you can get similar twigs to those in the picture, but they are over-scale. I think the impression is acceptable though- it’s for you to judge for yourself. For a bowl of individual bananas, use the seeds and paint them. The construction method is to use wood glue to fix a section of cocktail stick into one or both ends of a section of the twig. When the bunch of bananas grows on the tree, the flower juts out at the bottom of the bunch. Do a search of banana tree images to see what the bunches look like. I made the mistake of attaching the bunches to the tree the wrong way up until a friend burst my bubble! When the cocktail sections have dried they can be used to handle each bunch. 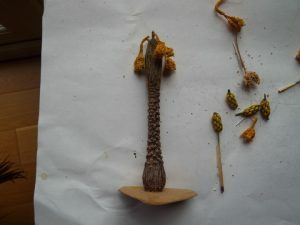 I you think the top of the bunch is too open, take some dried leaves from a spare piece of twig and glue them to the top layer around the stem. I then apply further layers of wood glue, pushing it between the dried leaves so that there are no spaces in there. I suggest you mix some dark green paint in with the glue to colour it – the glue I used didn’t take the paint very well at the painting stage. Then use yellow to hint at the bananas. An unripe bunch would be green and I suspect that these might make better green plantains, but I opted to have them yellow. The flower looks quite exotic if you wanted to model it, but I wanted a few for attaching them to trees, and some for porters and baggage. The one below has the stem attached to the tree and stem jutting out of the bottom where the flower, or riper fruit which has been harvested, would have been. If you are interested in the construction of the tree and can’t find the description elsewhere on Warfactory or a link, let me know and I’ll try and figure out where it is. Basically they are paper leaves on florists wire, and the stem is a spiral of masking tape cut with pinking shears to represent the bases of older leaves. On to the date palms. These are from a pack of mixed sizes but all of the same design. Wasn’t keen on the jagged stem, so cut the spikes back with a cheap craft knife. This is easier if you pull the leaves off of the lug that holds them in place. 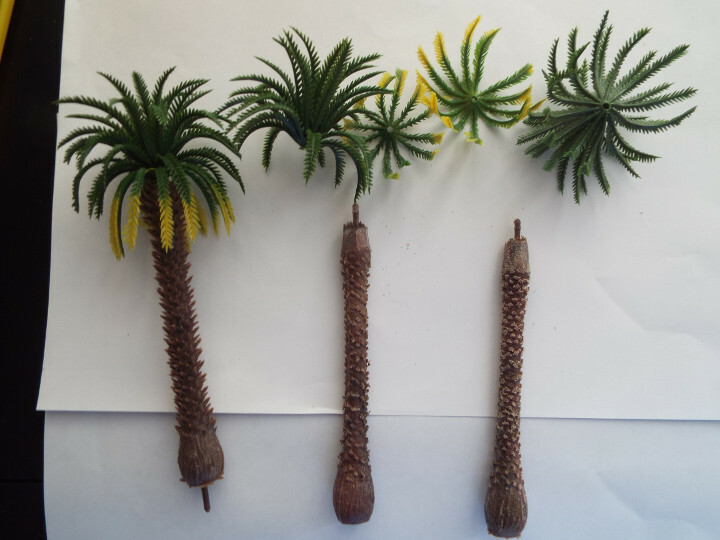 I think that palms look better if you try and replicate the remnants of older fronds hanging down from the crown, and in this case I wanted to have bunches of dates added in. The models bulge out near the top of the crown, I guess to represent this mass of vegetation. I trimmed it back with the craft knife. Next think was to rub the stem with some coarse sandpaper. It frays the cut spikes, to represent the less manicured appearance you would get in the wild as opposed to botanical gardens, where neat trimming creates a smoother appearance. I then painted the cut section at the top with a layer of wood glue and allowed it to dry. Looking at images of date palms, they show the fruits growing as bunches of long slender clusters, arching out from the trunk and hanging below the fronds. The fruit stems and fruit start as green, then the stem ripens to yellow, and the fruit will then ripen through yellow to brown/black. I started by dipping around 1 cm of the end of a strand of coir in wood glue, then rolling it in some yellow poppy seeds and letting it dry. The seeds are available in bags as cookery ingredients. Comes in handy being keen on cooking and gardening as well – always on the lookout for useful modelling materials. 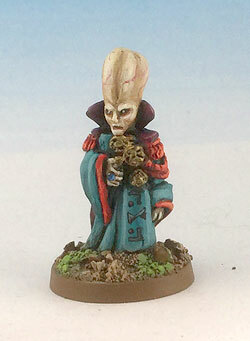 For me, these suit 28mm- for 15mm I think I would use fine sand but I’m not entirely sure I would bother with this below 28mm. 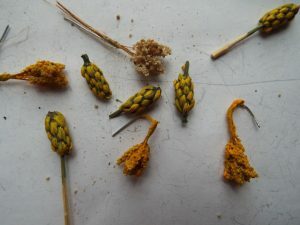 I then bundle 6 or 7 coir bunches together, together with a short length of flexible wire, a small amount of wood glue and wrap them together using a few strands of hemp – anything very fine will do. Once dry, I painted the whole thing yellow, mixing a little glue in with the paint to reinforce it. More glue and poppy seeds if you want to bulk up the bunches – these are quite substantial things. finally, bend the wire to get the arching effect. The bunch at the top in this pick shows the unpainted and unbent stage. Using Plumbers hemp or some other suitable fibres, glue a clump around the top of the stem and allow to dry. 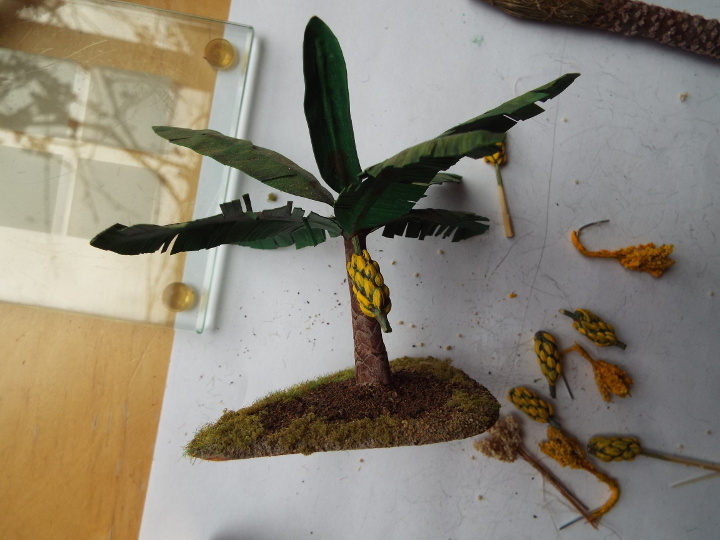 Next, using a mix of green and brown paint with some glue, paint the fibres to glue them back against the trunk. Add more fibres to thicken if you wish – with hindsight a slightly more ragged appearance would probably be better. When that is dry, highlight with a light brown/yellow/white mix to get the effect you desire, When it has dried, use a pin vise to drill one or more holes down into the top of the trunk – then dipping the wire on the date clusters in glue, insert these into the holes. Put the leaves back on to the lugs to get the final effect. 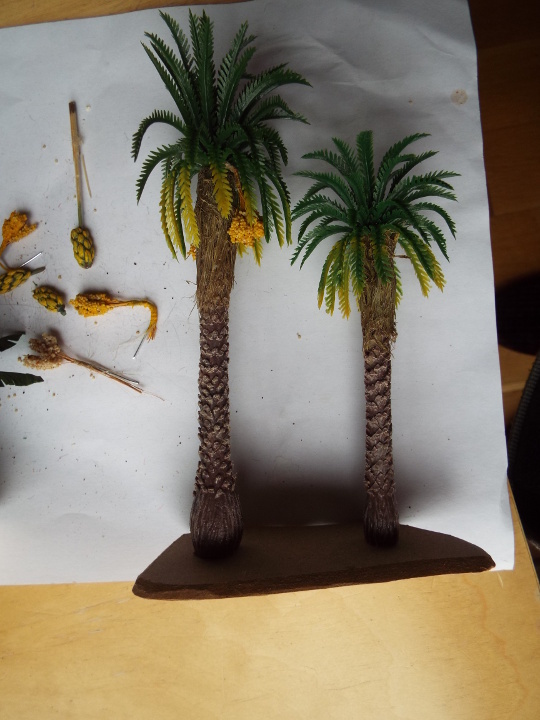 For basing, I cut off the lug at the bottom of the stem (NOTE – not the top one!) and use a power drill to drill a hole a centimetre or so deep through the bottom of the tree up through the step. I base them on mdf, and drill a hole through the mdf, then cut a recess around that hole on the underside of the base, then fix the tree to the mdf using a small screw dipped in woodglue. The recess is to make sure the mdf sits flat when the screw-head is in place. I think they are worth the extra trouble, although if I wanted a 100 of them I’d probably be less enthusiastic. Hope you like them and if you have similar ideas to share we would be glad to hear from you. First, I’d like to thank all the players that made this game a success. Right up until it started, I didn’t really know how it was going to go; the complicated scenario could have degenerated into a total mess, or maybe just a basic firefight. It worked because everyone really got into the spirit of the thing, and played their faction with character and gusto. 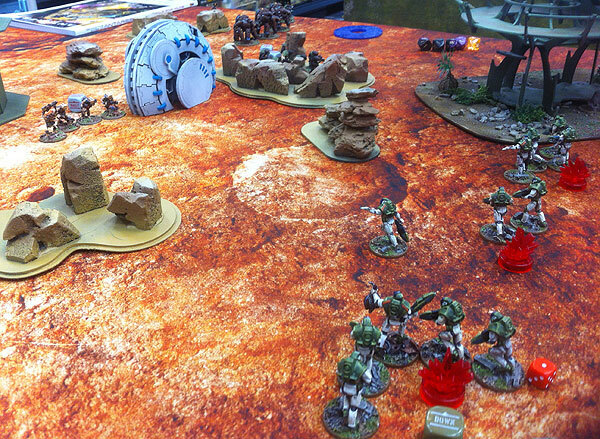 In addition James supplied a great selection of beasties (particularly important as I had forgotten mine), Niibl brought the Trading Guild – creative conversions done specifically for the scenario, and Fimm produced a beautifully converted set of AdMech in white, copper and green. Disclaimer: This was a fast moving and anarchic game – although I GMed it, I may well have got some of this wrong, so if you played and have any details or corrections, please do post them in the comments section. I have a number of the paper notes passed during the game – these appear in italics. 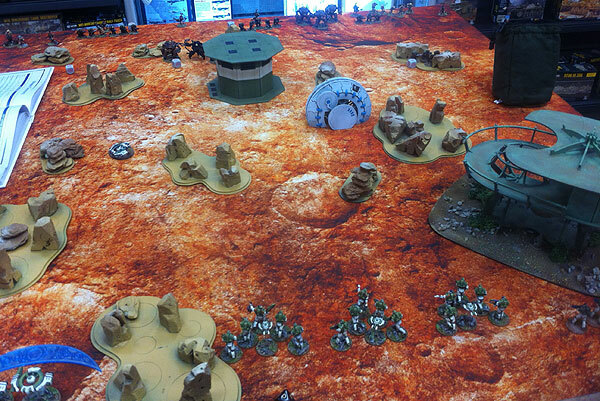 The game opened with the Inquisitor flanked by his two marine bodyguards advancing into the temple to inspect the mysterious artefact. Also inside the temple were the Trading Guild, who had been using one end of it as a store room. 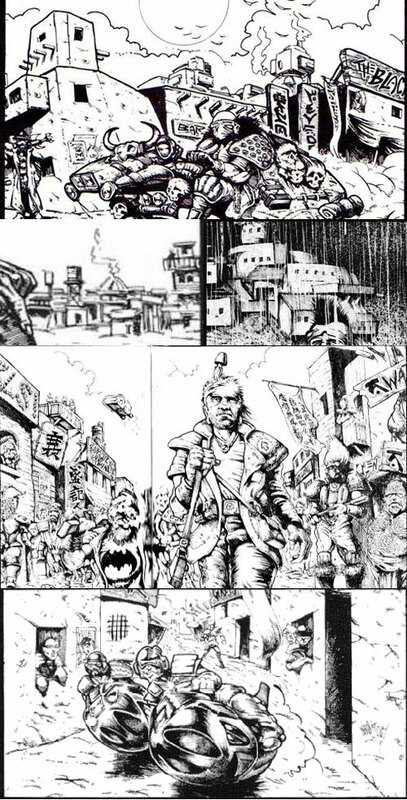 Their political rivals, the Mechanists were just outside – the advance party being led by the eccentric Dr Moenkhaus. Their primary objective was to secure this potentially powerful technology for themselves – another group of then was unloading a grav-trolley from their ornithopter to carry it away. Over by the gate the first conflict of the game was developing. A large group of natives had turned up – according to their folk lore, a powerful demon was imprisoned inside the cursed temple, and they feared that the ignorant city dwellers would release him. To save their people the natives had to stop them at all costs. The inquisitor and bodyguards, and a few Trading Guild started in the temple.Everyone else was outside. 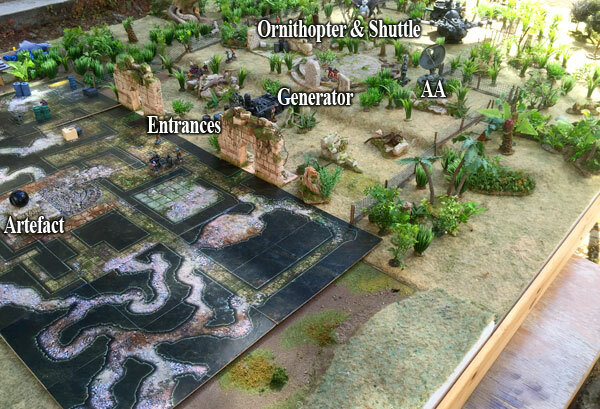 At the far end of the compound was the Mechanist’s ornithopter and the Trading Guild shuttle. The shuttle is particularly Oldhammer because the original chassis was made out of a shampoo bottle in 1987, inspired by the famous deodorant grav-tank. 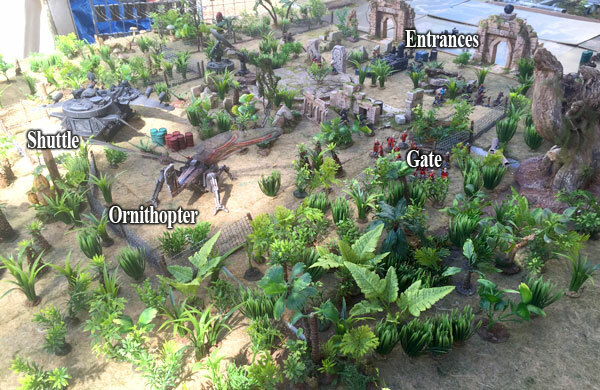 The large compound encloses a lot of ruins and jungle, so there’s plenty of places to hide. 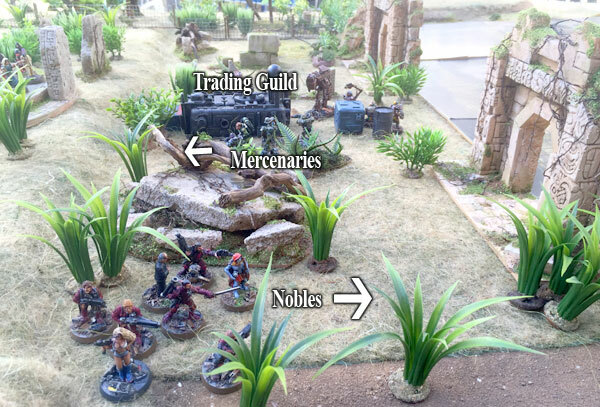 Here you can see mercenaries (employed by the Trading Guild) moving to block the natives coming into the compound (bottom left corner). 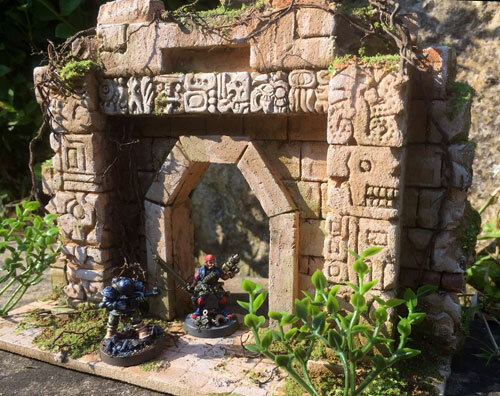 On the right, the Nobles’ hunting party heads for the nearest temple entrance, while in the middle of the compound some of the inquisitor’s experts examine a mysterious carved stone. Another shot of the start (around 3.30pm). 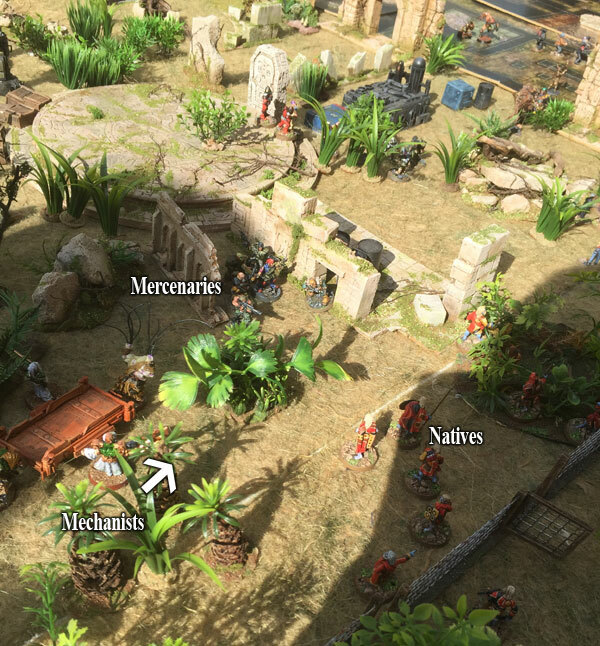 Mercenaries are moving away from the temple to help the other squad with the natives. Trading Guild are milling around the generator. 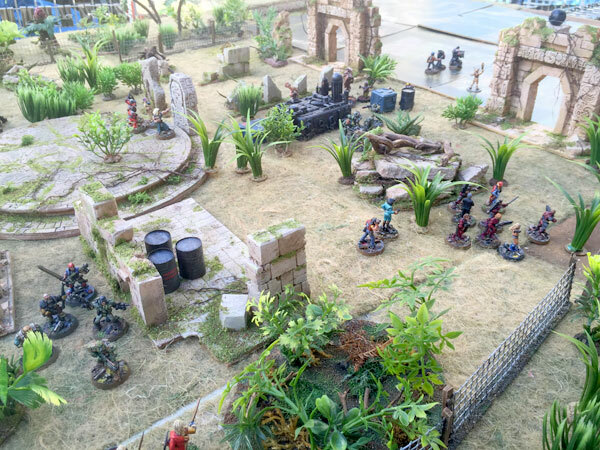 At the start of the game, a squad of mercenaries, hired by the Trading Guild to secure the site, lined up against the natives entering the compound and tore into them with their auto-guns. 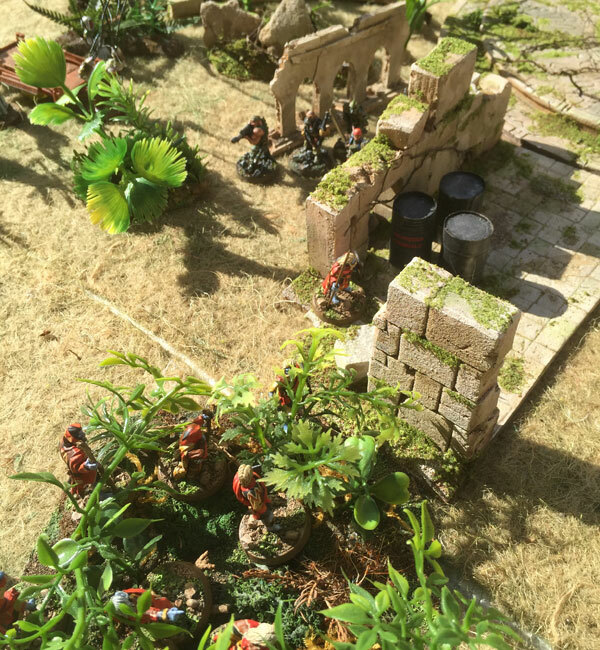 Natives ran in all directions – some retreating back into the jungle, others scattering and trying to hide in the meagre cover inside in the compound. Five or six went down and their mission seemed headed for failure when it had barely begun. Luckily they had a few tricks up their sleeve, and the city dwellers were not as united as they might have appeared. Meanwhile, the mechanists were coming up with their grav-trolley in the hope of carrying away the artefact. The sun had come out – we were playing on an outside table next to the marquee, and I remember it being atmospherically hot as the sun beat down. 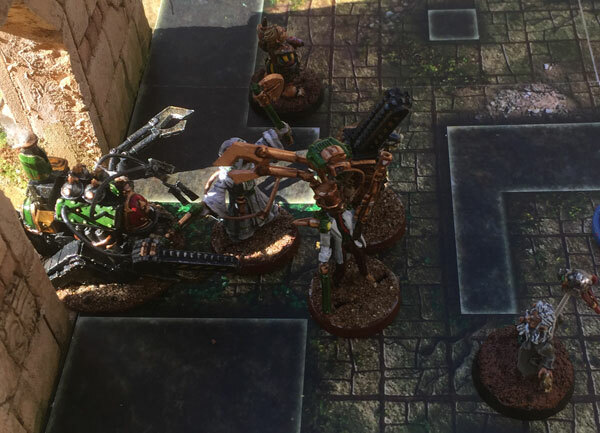 The Mechanist advance party, led by Dr Moenkhaus and attended by a lab-bot with typical scientific instruments such as a chainsaw and massive pincers had entered the temple to be met by the enraged Trading Guild. The Mechanists and the Trading Guild are political adversaries and to make matters worse, the Trading Guild had things to hide. 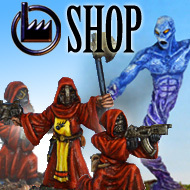 They were running a secret, unlicensed spiridium mine in the tunnels of the temple, and with unfortunate timing, a Slann merchant was visiting them to negotiate the purchase of a smuggled consignment. The Trading Guild suggested that the Mechanists might like to go somewhere else.. 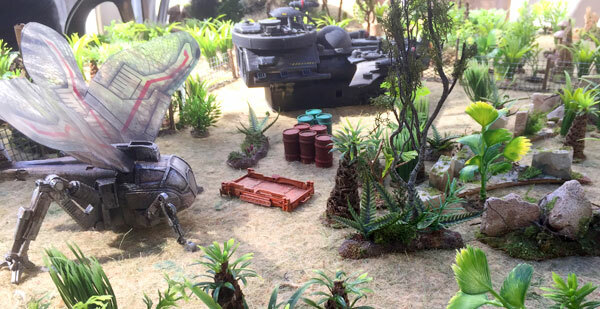 The natives continued to find themselves on the wrong end of civilisation’s firepower and the survivor’s were reduced to hiding in the bushes. The chief’s guard blew his horn to summon more tribesmen. A quick prompt about game objectives was needed. The Trading Guild, preoccupied with the Mechanists, realised what their mercenaries were up to, and after a quick word the natives were allowed to escape. Next part coming soon. I’d be interested to get any feedback on what people remember – does anyone have any good photos? 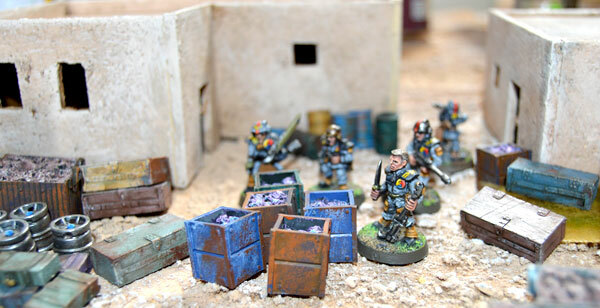 Here’s an Imperial Guard patrol looking for contraband in a merchant’s stash at the edge of the town. There are lots of types – water barrels (valuable on a hot, dry world), crates of ore, boxes of space spice, oil barrels and various boxes of trading goods/weapons. I’ve been experimenting with a rough, stained, rusted look (historically my style has been fairly neat and clean), and I’m really pleased with how some of these boxes turned out. Main change is that I’m using a folded up blister pack sponge a lot, to apply both patchy staining and highlighting. It is a bit random – some are better than others, but you have to just ‘let go’ a bit. Anyone else had any experience of this? 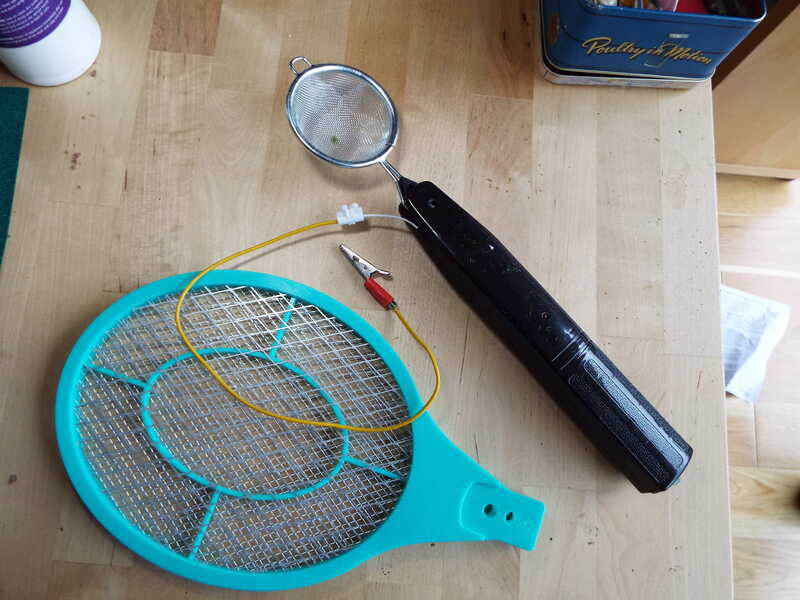 I went to Poundland and got a bug zapper for a whole £1, to wilkos to get a metal tea strainer for 80p, and to a hardware store for an alligator clip – 65p. Don’t have a soldering iron, so used a small connector to lengthen the cable for the Alligator clip. The tea strainer had plastic handle within the wire handle. I removed that and used a pair of pliers to shorten the wire handle, then cut the plastic insert a bit shorter and re-inserted it between the remaining prongs of the handle, securing it in place with some electrical tape. I bared the end of the red wire in the bug zapper, wrapped it round one of the prongs and used more tape to secure it. The other terminal in the zapper had 2 white wires. I cut one away completely, bared the end of the other and used an electrical connector to extend it with another piece of wire and put the alligator clip on that. Didn’t need to pack the handle with wood – made a hole in the plastic handle of the tea strainer and screw the zapper handle back together through it, which seems to hold it well. Popped in some batteries, and it worked! 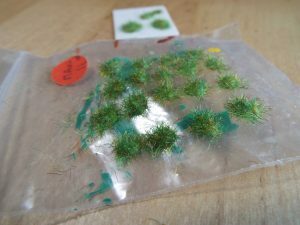 Popped some blobs of pva on a plastic bag, attached the alligator clip to the bag, put some static grass in the tea strainer bowl, turned the zapper on and shook the tea strainer over the blobs to deposit the grass. The stuff I have used is very short, but I am very happy with the first go.